You saw something you liked. You buy it. After using it once or twice, you just leave it somewhere and let it gather dust. Up to this day, it’s still gathering dust somewhere in your home. If so, you probably have a problem with clutter. This problem impacts your mental health, your ability to feng shui your home, and your home’s feng shui (if you have too much clutter). According to the Wall Street Journal, Americans spend $1.2 trillion on goods they do not need (2011). This may explain why there are 300,000 items in the average American home (2014) and why one out of every 10 Americans rent offsite storage (2009). It is a huge problem for many of us today because we live in an age of consumerism, where consuming goods and entertainment is the culture and way of life. This becomes a problem only when we over-buy or over-consume without organizing or disposing, because that’s how clutter builds up and gets out of control. Inability to Focus and Process Information: Having physical unorganized objects lying around are “visual stimuli” that competes for your attention, thereby affecting people’s task performance. Increase Stress: When people are dealing with their belongings, their stress hormones spike. Stress can lead to increased blood pressure as well as problems in the heart. Likelihood of Depression: Some experts see a relationship between clutter and depression. Other experts associated clutter with hoarding, with hoarding strongly linked to depression. Clutter doesn’t just affect your mental health. Having too much clutter also harms the feng shui of your home. Whether clutter belongs to feng shui is highly disputed. Though I agree that clutter is not really part of feng shui, I think it becomes a feng shui problem only when you have an EXCESSIVE amount of it. An excessive amount of clutter affects the flow of Qi and feng shui. Some examples of excessive amount are having items stacked ceiling-high that mimics a wall, or having no clear space to walk because your belongings are lying everywhere. They minimize your living space. They also have the ability to alter the Qi flow in your home and dampen the air quality as dust gathers. 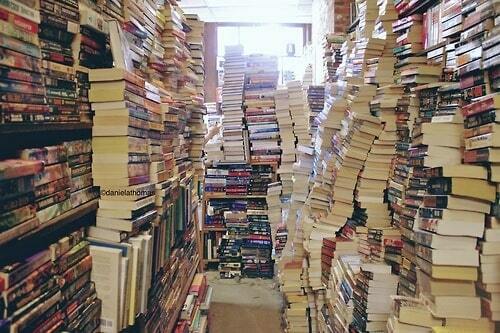 That is why some experts state that clutter prohibits your life from flowing and flourishing. Further, space is essential if you want to apply feng shui cures or enhancements. For instance, space is needed if you want to use a fish aquarium or indoor house plants to enhance the feng shui of an area. This is why clutter affects the ability for you to feng shui your home. By now, I’m hoping that you’re motivated to declutter. If so, here are some decluttering tips that I found helpful. I’ve organized them into three separate categories for you. Create a space for everything you want to store. For instance, create a folder to keep paper bills, a cabinet space for pots and pans, and a box for miscellaneous items. Just remember to nurture your habit of always returning the item to the designated spot. You can use something other than numbers to label your boxes. Photo by David Prince. 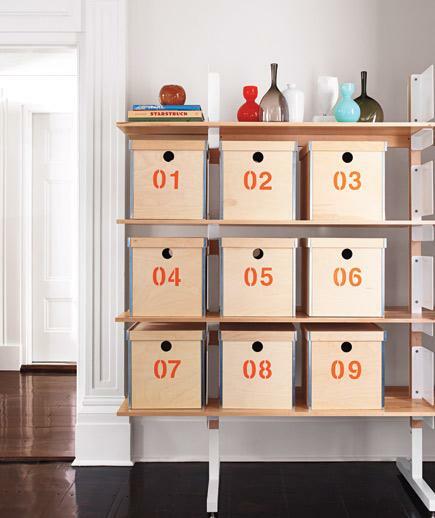 Not only will you have more space to enjoy, you will always be able to easily find your stuff. Here’s a way to create more space in your closet as suggested by Peter Walsh on oprah.com. 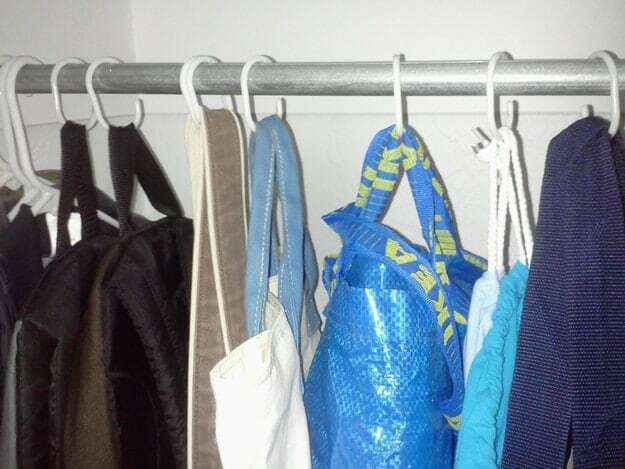 Turn all your clothes hanging in the closet to face the opposite way you normally hang them. After wearing them, turn them facing the other way. After six months or so, see which clothes are still hanging the opposite way. Those are the clothes that you should consider getting rid of. Tip #12 and #15 below can help you further with your closet. If you’re buying items for storage, don’t just go out and start purchasing them. Always organize before buying, because you need to know the container size that’ll fit under your bed, closet, or on the shelf. 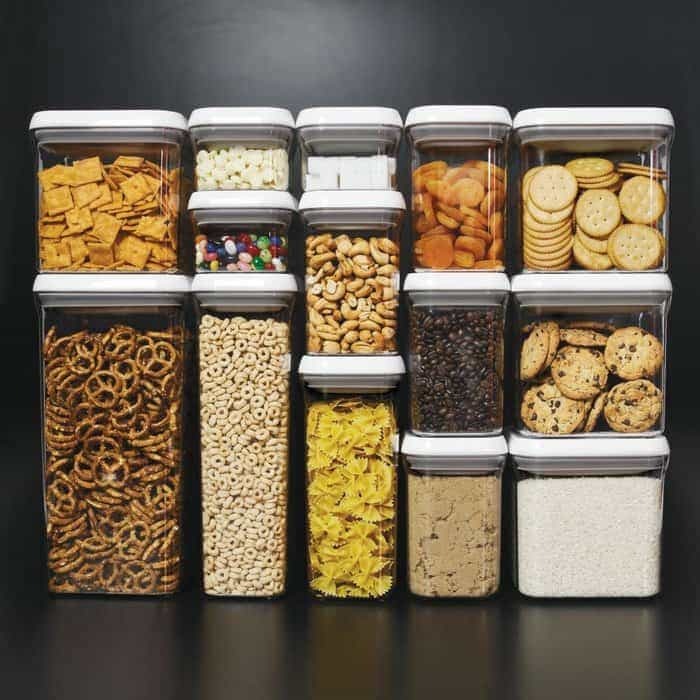 These food containers looks great on photo, but do they fit in your kitchen cabinet? This way, you won’t buy stuff that you’ll need to return later (or let them sit somewhere to gather dust). When you declutter, you already have a good idea about what you want to keep or dispose. Create five boxes and label them: trash, give away, keep, relocate (to a designated spot), and “maybe”. “Maybe” means those items that are maybe useful in the future. Once the “maybe” container is full, stash it somewhere, perhaps in your storage room or garage. If you don’t remember what’s inside that box the next time you see it (perhaps months later), you’ll realize that you don’t need any of them. Get rid of them and give yourself more living space! Colleen Madsen at 365 Less Things is all about reducing one item each day. Every Monday, Colleen would plan out seven “decluttering missions” for the week. To execute this plan, you’ll need to designate a few minutes each day to reduce your stuff, perhaps five to ten minutes after dinner or before you go to bed. The trick is to make it a habit. Just as how Colleen Madsen plans out “decluttering missions”, you should plan out how you want to declutter. This plan is essential if you have multiple places to declutter, because you can get quite indecisive on how and where to start. 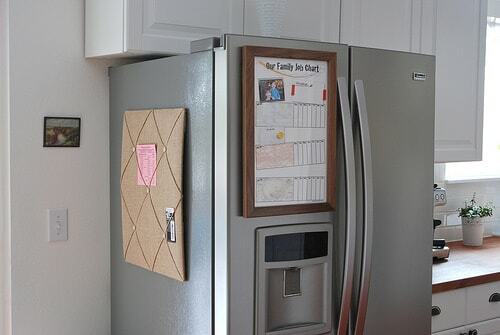 Keeping your decluttering plan visible, like on a whiteboard in the kitchen. A more focused approach, as suggested by Dana Byers, is to create a list of places to declutter. Follow the list, and when you’re done with an area, STOP. Then work your way down your list the following day or next weekend. Do not spend an entire day decluttering because you’ll wear yourself out and become less productive. 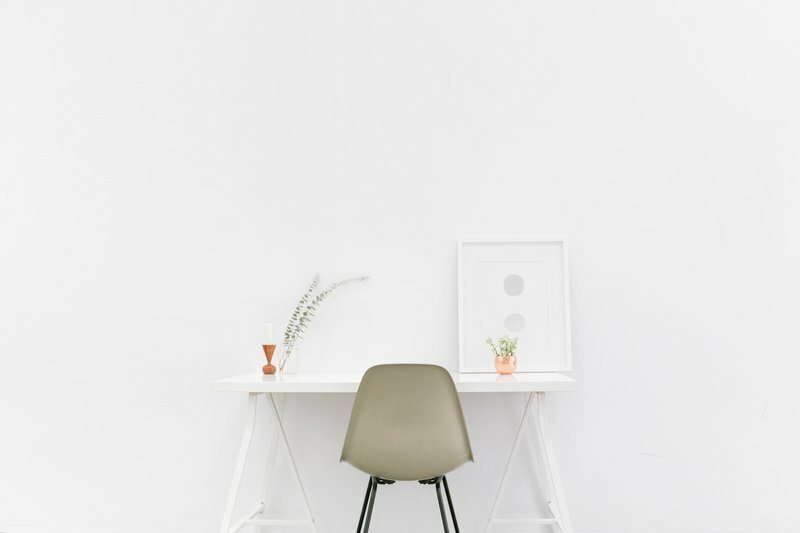 Just like exercising and going to work, you’ll need to commit to make decluttering as part of your daily routine. This is especially helpful for those who work on a tight schedule. For example, you can make yourself do a little bathroom cleaning when you brush your teeth, or make it a habit to organize your living room when your favorite TV show is on a commercial break. I got this idea from Joshua Becker’s 12-12-12 challenge. His challenge is to find 12 items to donate, 12 items to throw away, and 12 items to be returned to their proper home (or designated spot). He mentioned that this became a competition between his wife and him. So my idea is: why not make decluttering a game or a friendly competition between you and your family members (or those living with you)? Remember to add some rewards so everyone will take it more seriously! This applies mostly to bills and papers. Create marked folders by status (paid, unpaid) or by category (utilities, mortgage). Once you’ve taken care of the bill, file only the bill and throw away the envelopes. Take advantage of today’s technology and go digital and paperless. Image from jenniferhou.com. Another way is to go digital and paperless (that’s what I do now). Just remember to setup auto-pay or email reminders so you won’t miss any payments. Follow-through and finish your tasks. If something needs to be donated, put it in your car and make the arrangements right away. Don’t just let that pile of “to be donated” items sit in your car or in your house, because it’ll really sit there for who knows how long. Similarly, if something needs to be trashed, put it in your trash bin. Go the extra mile to complete all the tasks you started. 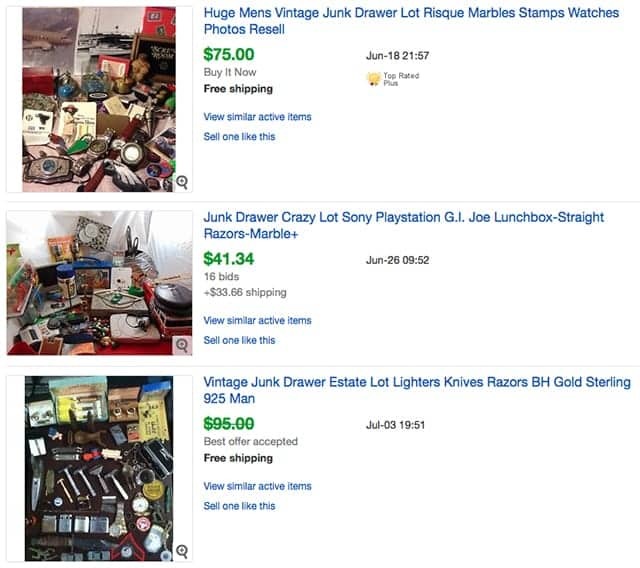 “One man’s junk is another man’s treasure.” If you’re wondering how much your clutter is worth, go to websites such as eBay or Amazon to find out. You’d be surprised on what you can sell on eBay. Image from 25 surprising things you can sell on eBay. The longer your “junk” stays in your home, the less it’ll be worth. 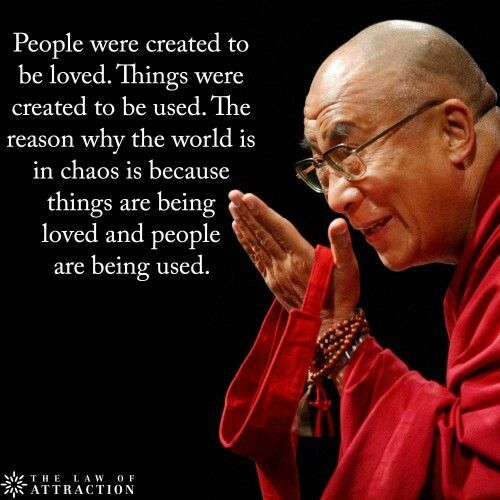 That is why you should start decluttering and selling some of your items right away. Perhaps you can even earn a small fortune! Jim Davies, Ph.D., suggests that you use imagination to reduce clutter in your home. Here’s his example on how to rid yourself of things with little value. Say you’d want to get rid of your digital camera. Go on eBay and check the price of your digital camera. If you’re NOT willing to pay that price to buy that camera, then get rid of it (or you can sell it using the previous tip). You’ll realize how little you actually value some things you can’t part with. Before you start decluttering, imagine how you want your decluttered home or room to look. Decluttering is your opportunity to give your home a fresh new look, and a mental vision will motivate you towards that direction. If you find yourself lacking imagination, you can always get ideas by looking at pictures from magazines or Pinterest. This is not simple, but it is the most important and life-changing one. If you can stop impulse buys, not only have you solved future clutter problems, you’ll also be saving money! To stop impulse buys, you need a change in perspective. You need to tell yourself to buy only the items you need. When shopping, try not to even touch the objects you don’t need, because research has shown that the sense of touch creates attachment with an object. Just walk away, even if it’s the last item on the shelf or if it’s on sale. Soon enough, you’ll notice that you don’t even remember what it was that you desired so badly. Closets are tough. In addition to the Closet Hanger Experiment mentioned earlier, you can ask yourself this question when decluttering your closet: “If I were shopping right this second, would I even buy this item?” If the answer is NO, get rid of it. Once you’ve cleared an area, form an emotional attachment with it. Take the time to enjoy your space and remember that positive feeling. Create an emotional attachment with your clutter-free environment. When clutter starts eroding this precious space, you’ll take action before it becomes a big problem. Here are a few other tips that I found useful and easy to implement. They are ideas on how to organize, taken from 34 Ingenious ways to De-Clutter Your Entire Life and 9 Decluttering Secrets from Professional Organizers. I’ve only picked the ones that I feel are more practical and easy to implement. This is very useful if you have lots of bags or purses. These shower curtain hooks can be used in your walking closet or the closet right next to your front door. Most of us have multiple remotes – TV, DVD/Blue-Ray, cable, and so forth. 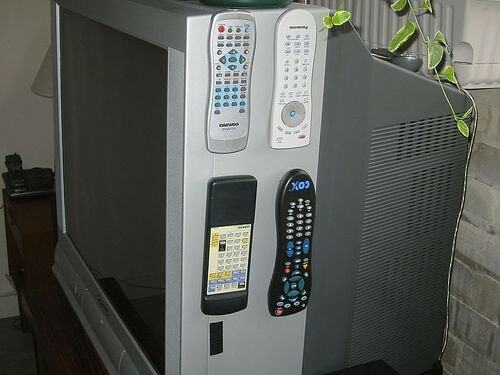 Using Velcro for your remotes will prevent them from missing and tidies your living room. You just have to get into the habit of placing them back to the Velcro. The alternative to this is to use a universal remote or a universal remote app on your phone, where multiple devices are programmed into one single remote control or in your smart phone’s app. 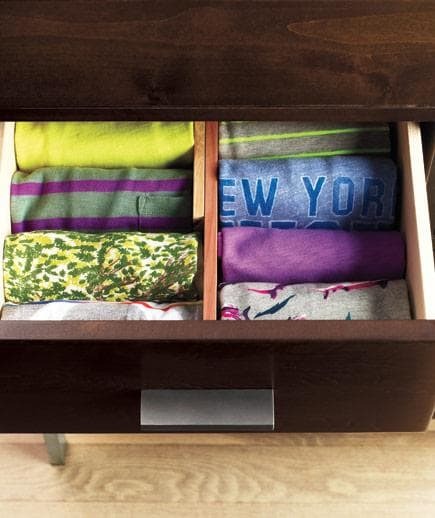 If you want more space in your drawers, try rolling up your T-shirts. This technique is said to give you a third more space in your drawers. Though the image above used a divider, not using one should do just fine. Not only does decluttering improve your mental health, it’s also essential to your home’s feng shui. Only by clearing space can you place objects such as plants or fish tanks to enhance your home’s feng shui. If you have an excessive amount of clutter, remember to commit to a long-term battle. An empire is not built in one day, so celebrate progress as you go along. Soon, you’ll notice that you’re enjoying your space with a happier mood. Among all the tips mentioned here, what worked best for me was this mental tip: stop the impulse buy. When I changed my perspective to only buy the things I truly need, clutter never got out of control, and organizing and cleaning became incredibly easy. What decluttering tips have worked best for you? Let us know by commenting below!